In the preface to which he is gratefully commemorated. See —Gent. Mag. vol. LXI. pp. 743, Ilf8, 1207. | had designed, for Mr. Nichols’s “History of Leicestershire.” He had completed also some views of King’s college chapel at Cambridge, in a style worthy that most beautiful and most perfect of all our gothic buildings, and in a manner which had so far recommended him to royal notice, that, had his life been spared, there is no doubt but he would have been properly distinguished. 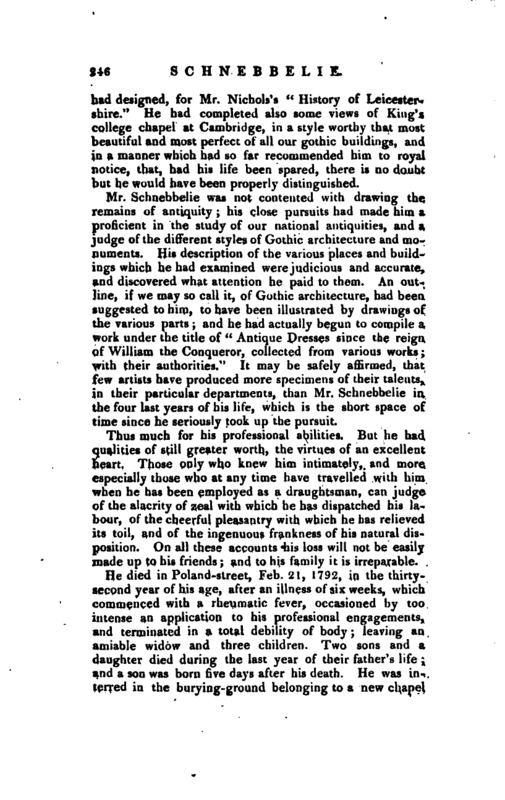 Mr. Schnebbelie was not contented with drawing the remains of antiquity; his close pursuits had made him a proficient in the study of our national antiquities, and a judge of the different styles of Gothic architecture and monuments. His description of the various places and buildings which he had examined were judicious and accurate, and discovered what attention he paid to them. An outline, if we may so call it, of Gothic architecture, had been suggested to him, to have been illustrated by drawings of the various parts; and he had actually begun to compile a work under the title of “Antique Dresses since the reign of William the Conqueror, collected from various works; with their authorities.” It may be safely affirmed, that few artists have produced more specimens of their talents, in their particular departments, than Mr. Schnebbelie in the four last years of his life, which is the short space qt" time since he seriously took up the pursuit. Thus much for his professional abilities. But he had qualities of still greater worth, the virtues of an excellent heart. 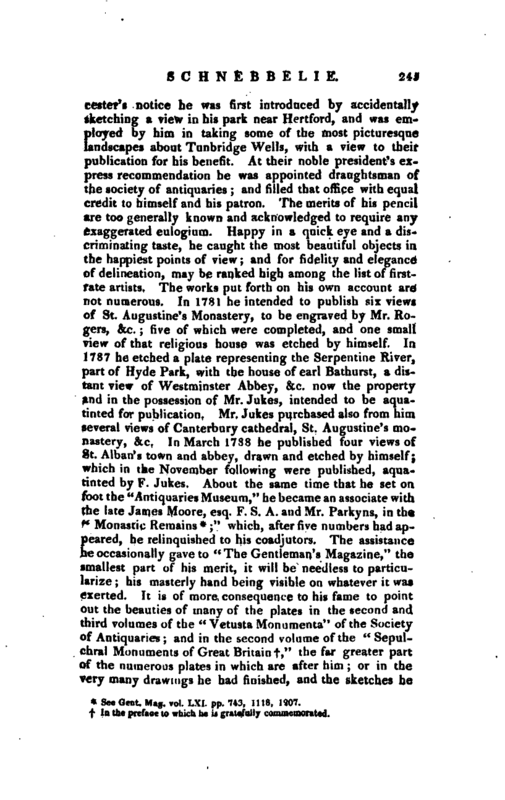 Those only who knew him intimately, and more especially those who at any time have travelled with him when he has been employed as a draughtsman, can judge of the alacrity of zeal with which he has dispatched his labour, of the cheerful pleasantry with which he has relieved its toil, and of the ingenuous frankness of his natural disposition. On all these accounts his loss will not be easily made up to his friends; and to his family it is irreparable. 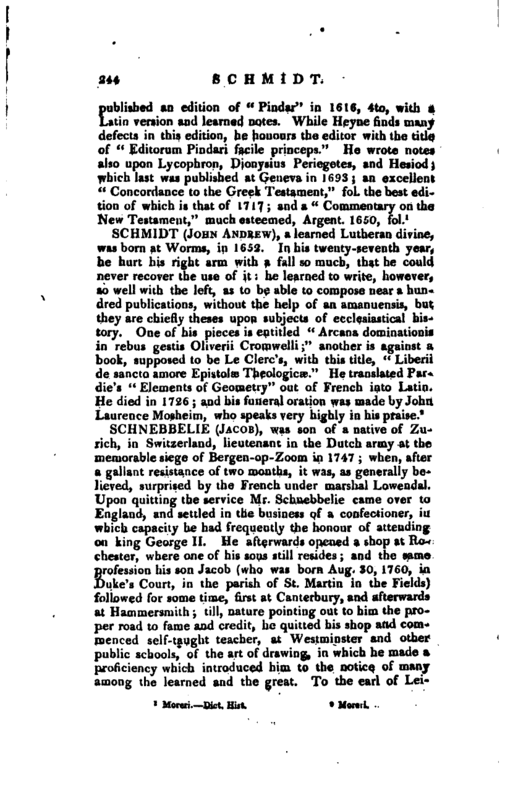 He died in Poland-rstreet, Feb. 21, 1792, in. 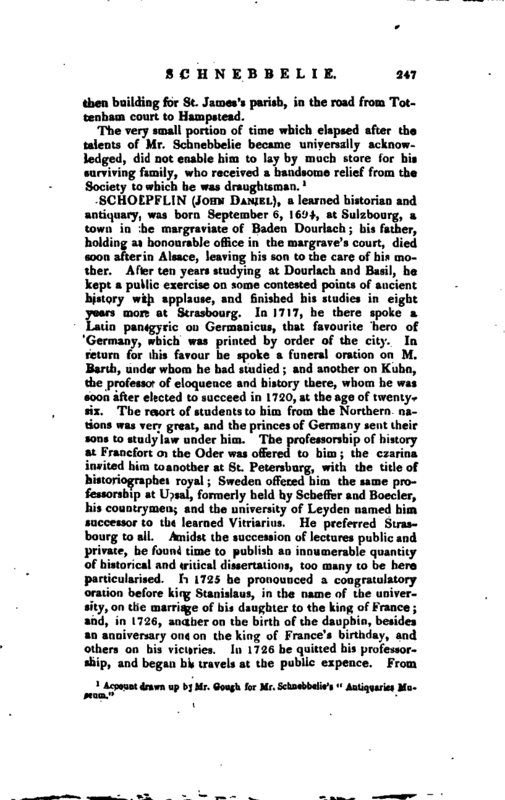 the thirtysecond year of his age, after an illness of six weeks, which commenced with a rheumatic fever, occasioned by too intense an application to his professional engagements, and terminated in a total debility of body; leaving an amiable widow and three children. Two sons and a daughter died during the last year of their father’s life; and a son was born five days after his death. He was interred in the burying-ground belonging to a new chanel | then building for St. James’s parish, in the road from Tottenham court to Hampstead.